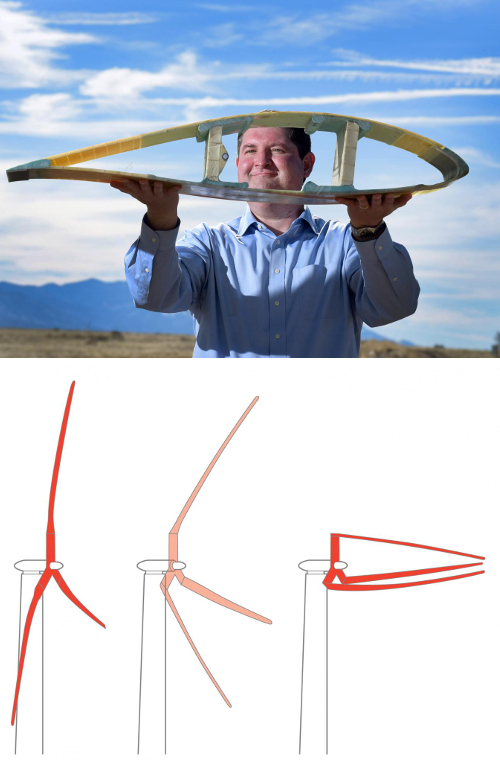 By existing designs, a 50 MW horizontal wind turbine is simply impossible, but studies show that load alignment can dramatically reduce peak stresses and fatigue on the rotor blades. This could be the key to success for Sandia National Laboratories; the group that has launched research on extreme-scale Segmented Ultralight Morphing Rotor (SUMR). SUMR rotors are being tested as a way to reduce costs and allow construction of blades big enough for a 50 MW system. Currently, the largest commercially available turbine is rated at about 8 MW with blades 80 metres long, but it not just a matter of making them bigger. “Conventional upwind blades are expensive to manufacture, deploy and maintain beyond 10-15 MW,” says Todd Griffith, lead blade designer on the project and technical lead for Sandia's Offshore Wind Energy Program. “They must be stiff, to avoid fatigue and eliminate the risk of tower strikes in strong gusts. Those stiff blades are heavy, and their mass, which is directly related to cost, becomes even more problematic at the extreme scale due to gravity loads and other changes,” Griffith said. He said the new blades could be more easily and cost-effectively manufactured in segments, avoiding the unprecedented-scale equipment needed for transport and assembly of blades built as single units. SUMR's load-alignment is inspired by biology, especially the way palm trees move in storms. The lightweight, segmented trunk approximates a series of cylindrical shells that bend in the wind while retaining segment stiffness. This alignment radically reduces the mass required for blade stiffening by reducing the forces on the blades using the palm-tree inspired load-alignment approach. Segmented turbine blades have a significant advantage in parts of the world at risk for severe storms, such as hurricanes, where offshore turbines must withstand tremendous wind speeds over 320 km/h. The blades align themselves to reduce cantilever forces on the blade through a trunnion hinge near the hub that responds to changes in wind speed. “At dangerous wind speeds, the blades are stowed and aligned with the wind direction, reducing the risk of damage. At lower wind speeds, the blades spread out more to maximise energy production.” Griffith said.